As you approach Runcorn’s Norton Priory site, tucked behind a modern industrial estate, there is very little clue of this 12th century monastery site’s historical significance. Currently undergoing significant redevelopment as part of a HLF funded capital project ‘Monastery to Museum 900’, the priory is due to reopen its doors this coming August showcasing a fully redeveloped museum and newly conserved undercroft. As the most excavated medieval monastic site in Europe, Norton Priory boasts some of the most incredible stories and objects which will be displayed more fully than was previously possible in new innovative first floor viewing gallery which will help visitors better understand the ruins while also carefully preserving the grade 1 listed 12th century undercroft to properly demonstrate the sites national historical significance. 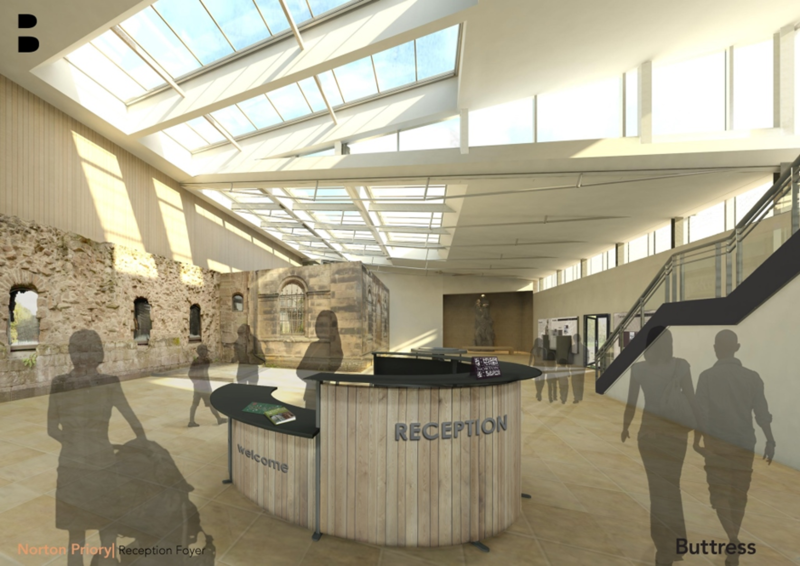 Although visitors are obviously an important focus of Norton Priory’s ‘Monastery to Museum 900’ development project, one of the aims of the £4.5m redevelopment is also to help with the Priory’s future sustainability. Engaging larger audiences will be integral to this, with visitors to the museum anticipated to increase by 60%, greater audiences will of course increase admission and secondary spend income. In consultation with local teachers, the project will also double the size of the learning suite to provide facilities for larger school groups helping to deal with the rising costs in transport and further pressures on their pupils time in school. Central to all of the decisions made during the project’s development was the need for flexibility, particularly for providing means to offer event, wedding and conference facilities. The learning suite will not only double in size, it will also have a moveable partition allowing for the space to seat 100 people theatre style. In one of the new exhibition spaces, an area has been opened to provide an activity space designed to demonstrate traditional skills, linked to the Priory’s traditional skills programme which provides another source of income. Given the continuous squeezing of local government budgets, it feels important to note that Norton Priory’s redevelopment will not only demonstrate the historical significance of this important monastery site, it will also put in place a solid structure for in-house income generation to help secure the museum’s future. The Clothworkers’ Company offer up to £1,000 towards registration, travel, and accommodation costs to help qualified conservators attend conferences, short courses, and seminars. The bursaries are designed to cover 50% of the total cost of attending, to a maximum of £1,000. On application, The Clothworkers’ Company expect you to have already raised the remaining funds via your employer, personal funds, or by other means. However, if you are unable to do this, they may consider awarding more than 50% depending on your individual circumstances.